The acclaimed Man ‘O War male line was one of the American turf’s most revered male lines, due to the everlasting fame of the great horse. The line did produce War Admiral, the 1937 Triple Crown wining son of the legendary Big Red and a host of good sires and broodmares during the 1920’s, 30’s and into the 40’s. However the line began a steady decline with the importation of some of the best pedigrees from Europe, such as Pharamond II, Sickle, Sir Gallahad III, Bull Dog, Blenheim II, Mahmoud, Princequillo and the sons of Hyperion and Nearco. These imported sires would dominate American bloodlines, with an occasional champion from one of the old male lines that had been established before the 1920’s. The Man O’ War line is still surviving through the War Relic branch. He sired Intent, who in turn sired Intentionally, sire of In Reality. 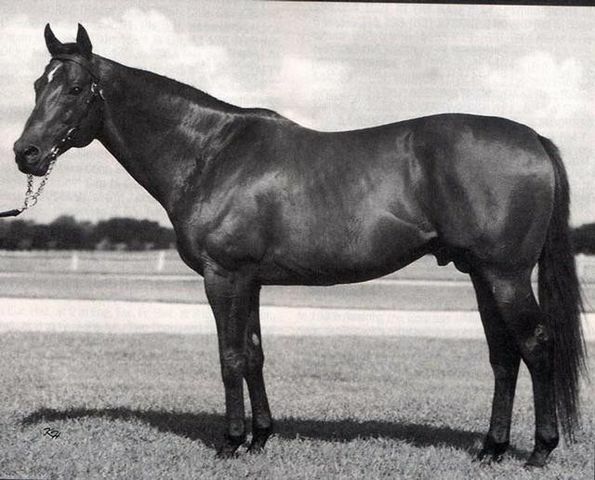 Intentionally had also sired Tentam (United Nations Handicap, Metropolitan Handicap, Bernard Baruch Handicap, Toboggan Handicap and the Jim Dandy Stakes), who was a good sire until his early death at the age of twelve. However, it was through In Reality that the Man ‘O War male line would begin to resurface among the major stakes winners of the day. In Reality was bred in 1964, which has in hindsight, turned out to be a watershed year for the revival of some of the old American sire lines. The dam of In Reality was My Dear Girl, the 1959 champion two year old in America. She won the Frizette and the Gardenia Stakes during her championship year. My Dear Girl was bred by the Ocala Stud in Florida and was owned by Francis Genter during her racing and breeding careers. My Dear Girl became another of the important Thoroughbreds that not only revived the Florida breeding industry, but also was instrumental in the survival of the Man ‘O War male line. My Dear Girl was sired by Rough ‘N Tumble, and upon her tryst with Intentionally, she produced In Reality. This represents a reverse breeding of Great Above (sire of champion Holy Bull) as he was by a son of Rough ‘N Tumble out of the mare Ta Wee by Intentionally. In Reality was a top class race horse, but had to pick his spots carefully to avoid his contemporaries Dr. Fager and Damascus, as he was just a slight cut below those two on the track. In Reality won the Pimlico Futurity over Successor as a two year old, during the latter’s championship season. At three, he would win the Fountain of Youth Stakes and the Florida Derby but could not avoid Damascus in the Preakness Stakes, finishing second to that one. He would the take the Jersey Derby, the Rumson Handicap and the Choice Stakes before meeting Damascus again in the American Derby at Arlington Park, finishing second. A meeting with Dr. Fager in the New Hampshire Sweepstakes would be another second place showing, followed by the Jerome Handicap against High Tribute, finishing second yet again. This would be his final race of the 1967 season. In 1968, trainer Melvin Calvert avoided Dr. Fager and Damascus as much as possible and race In Reality where those two weren’t. His “hit ‘em where they ain’t” policy would get his horse three good handicap victories in the Carter, Metropolitan and John B. Campbell Handicaps. In Reality completed his racing after 1968 with a very respectable record of fourteen wins from twenty-seven starts, finishing second nine times and third twice. He was only out of the money in two races. In Reality was a hard knocking honest race horse and would now go to stud in Florida for Mrs. Genter. In Reality proved to be a very consistent source of sound, fast horses and the progenitor of excellent sires and broodmares. He was inbred to War Relic 3 x 3, and would turn out to be the key link to further the male line of War Relic’s sire, Man ‘O War. Among his top get were; Desert Vixen, the champion female at three and four and a Hall of Fame inductee, who was also the dam of Real Shadai, a leading sire in Japan. Basie was a Delaware handicap winner, while her full brother Its True won the Louisiana Handicap. Proper Reality won the Metropolitan Handicap and the Arkansas Derby. Two sons of In Reality were major American stakes winners and then became the dam sires of two winners of the Kentucky Derby and Preakness Stakes. Smile was the Eclipse Award Champion Sprinter in 1986 after his big victory in the Breeder’s Cup Sprint, and is the dam sire of Smarty Jones. Believe It won the Wood Memorial and is the dam sire of Real Quiet. There would be more; Truly Bound won the Arlington-Washington Futurity and the Ashland Stakes during a nine wins from twelve races career; Valid Appeal, a full brother to Desert Vixen, won the Dwyer Handicap and then became a successful sire of eighty-six stakes winners which includes Proud Appeal, Mighty Appealing, Southern Appeal, Stormy But Valid, Mister Jolie, Valid Wager and Valid Expectations. The latter becoming a good sire himself. Known Fact comes from an excellent family that includes Tentam, Gone West, and Tappiano. Known Fact won the 2000 Guineas (after Nureyev was DQ’d), the Middle Park Stakes and the Queen Elizabeth II Stakes. He stood as a sire at Juddmonte Farm in Kentucky where he was quite successful. His most prominent progeny were; Markofdistinction (Queen Elizabeth II Stakes, Queen Anne Stakes); Warning (Sussex Stakes, Queen Elizabeth II Stakes, Queen Anne Stakes etc), also a good sire; Binalong (Gulfstream Sprint Championship, Olympic Handicap); So Factual (Nunthorpe Stakes); and T V Heart Throb (NY Breeder’s Futurity, Empire Stakes). In Reality as a broodmare sire has also been a major influence. His daughter Inreality Star produced Meadow Star by Meadowlake, winner of the 1990 Breeder’s Cup Juvenile Fillies, Frizette Stakes, Spinaway Stakes and Matron Stakes, to be named the Eclipse Award Champion Two Year Old. Meadow Star added the Mother Goose and Acorn Stakes to her grade one winning resume as a three year old. Bought Twice, a half sister to Fappiano, is the dam of Commendable (Belmont Stakes in 2000) by Gone West. Landera is a direct female line descendant of La Trioenne, who produced Cutlass Reality (Hollywood Gold Cup, Californian Stakes etc) by Cutlass, a son of Damascus. There are some very good sires standing recently that have come from granddaughters and great grand daughters of In Reality. Image Of Reality is the dam of Toussaud by El Gran Senor, who in turn is the dam of Empire Maker by Unbridled and Chester House by Mr. Prospector. Toussaud’s daughter Honest Lady by Seattle Slew is the dam of current hot sire First Defense by Unbridled’s Song. In Reality was bred twice to the good mare Foggy Note, a grey daughter of The Axe II. The first foal was a filly of 1972 named Moon Glitter, who produced multi stakes winner Glitterman by Dewan, as well as Ruby Slippers, by Nijinsky. Ruby Slippers in turn has produced champion sprinter Rubiano by Fappiano. Rubiano is the dam sire of current international stallion sensation War Front by Danzig. Ruby Slippers is also the dam of stakes winner Tap Your Heels, the dam of today’s leading American sire Tapit by A.P. Indy. Charedi, a direct female line descendant of Aspidistra, is the mother of Gana Facil by Le Fabuleux, who in turn produced Unbridled by Fappiano. Printing Press is the mother to Lite Light, winner of four grade one races as a three year old. In Reality has had an impact in South America with his daughters. Balladry is the dam of Chilean horse of the year Ballistic, while Wooden Whistle produced Wooden Girl, champion sprinter in Argentina. When In Reality was bred a second time to the grey broodmare Foggy Note in 1975, a grey son named Relaunch was foaled the following year. Relaunch was not one of the top stakes winners by In Reality, the Del Mar Derby was his biggest stakes victory, but he did go on to be the link to continue the male line. Descending from Relaunch would be his son Cees Tizzy, who in turn sired two times Breeder’s Cup Classic champion Tiznow. Relaunch has also sired Skywalker (Breeder’s Cup Classic) who has continued the line with his son Bertrando (Woodward Stakes) and on to that one’s son Officer (Champagne Stakes). Tiznow in the U.S. and Officer now in Korea, have each sired multiple grade one stakes winners, keeping the In Reality branch of Man O’ War’s direct male line going. This line has a special place in the hearts of thoroughbred fans, no doubt due to the legend of “The mostest hoss ever” as put forth by Man ‘O War’s stud groom Will Harbut. In Reality has played a huge part in keeping the legend alive. He sired five hundred and fifty-five named foals, eighty-one of which were stakes winners, for a 14.6% strike rate. His daughters have produced over one hundred and fifty stakes winners. In Reality lived until the age of twenty-five, when he was humanly euthanized on May 8, 1989 due to the dreaded laminitis. He was a consistent hard knocking sire, much like his consistent hard knocking race career, and has left an indelible mark on the breeding landscape. I for one would like to see more of his kind standing stud today.